． Flashing light system is adopted, the unbalance angel is easy to be located. ． The filter has the sensitive feature, that will eliminate the out coming vibration influence. 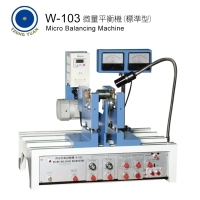 ． Equipped with filter frequency check installement which can reserve the accuracy of filtering frequency. ． Two magnifiers and two lifht meters indicate the unbalances of both left and right ends separately at same time. ． Integrated circuit(IC)is adopted, assuring longer lift and greater reliability.